With the new version of SharePoint in Public Beta (links). It is time to start with the installation of the prerequisites. When you do not already have the image of the SharePoint 2013 Public Beta download it. The link for the download can be found in my previous post. 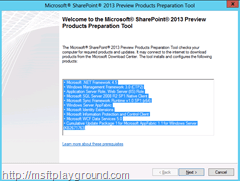 This post will point to the installation of the prerequisites for SharePoint 2013. 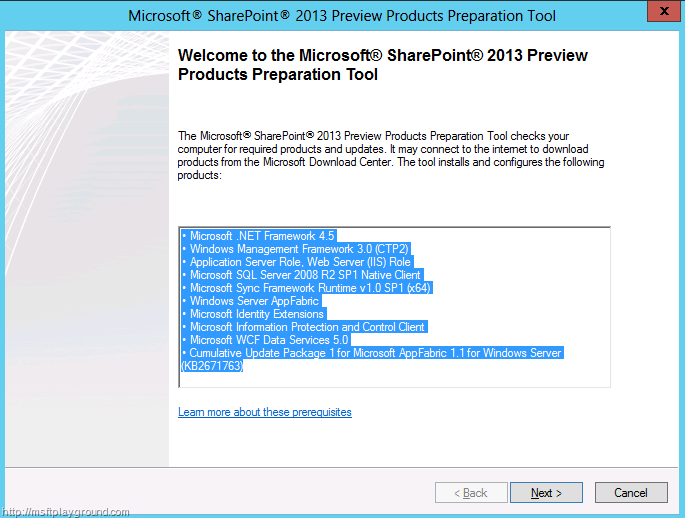 The prerequisites that we will install is a bit more than the prerequisites that are on the image off the SharePoint 2013 Preview. ILSPY: http://wiki.sharpdevelop.net/ILSpy.ashx we will use this to look into some SharePoint dll’s. 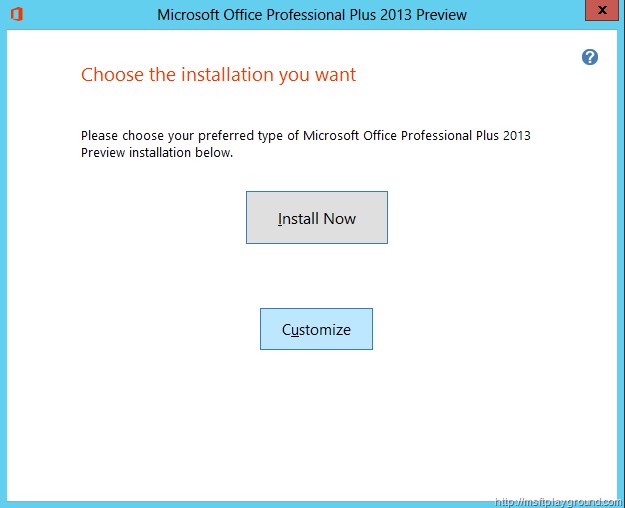 Microsoft Office Professional Plus 2013 Preview: You can download this from MSDN http://msdn.microsoft.com/nl-nl/subscriptions/downloads/default(en-us).aspx. Microsoft Office Visio 2013 Preview: You can download this from MSDN http://msdn.microsoft.com/nl-nl/subscriptions/downloads/default(en-us).aspx. SharePoint Server 2013 Client Components SDK: The SharePoint Server 2013 Client Components SDK can be used to enable remote and local development with SharePoint Server 2013. http://www.microsoft.com/en-us/download/details.aspx?id=30355. First off we will create a new Admin user called SharePoint Administrator. 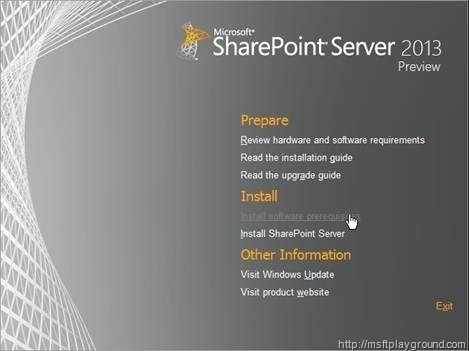 With this user we will perform the SharePoint installation but we will also use this user to login on the Beta machine. With this user in place search for the domain administrators group and add the current user to that group. Now logoff the current user and login in with the SharePoint Administrator account to install the prerequisites. Download ILSPY from the ILSPY website and place the zip file on your virtual machine. Extract the file and place it in a easy location. For easy use I have placed a shortcut on my desktop. 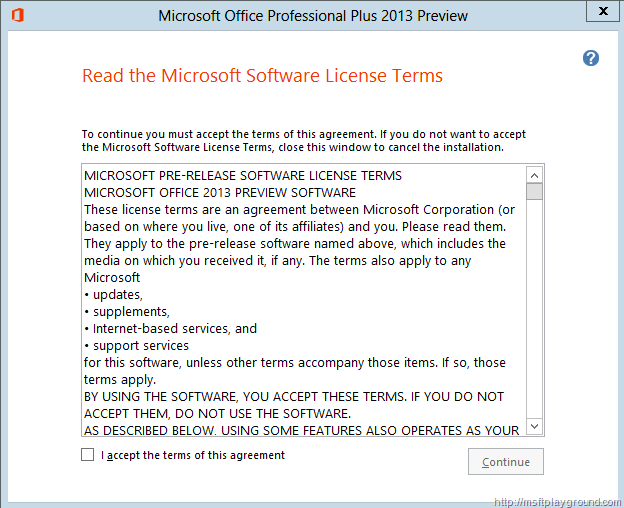 Next up is the Microsoft Office Professional Plus 2013 Preview. If you have downloaded the image add it to the virtual machine. If you do not have the image just skip this step. 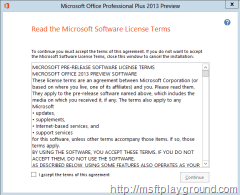 The first step of the Installation is the acceptance off the license terms. Accept the terms and click continue. The setup will continue with a step that is know when you have ever installed Office for know we will select “Customize” because I want to check what it will be installing. In the customize installation window you can see all the component the install will install on you machine. Notice that Microsoft Lync is a new one. Looks like it is now integrated in the Office Suite . Make sure you do not install the Visio Viewer, this because we will also install the complete version. Select “Install Now” to start the installation. 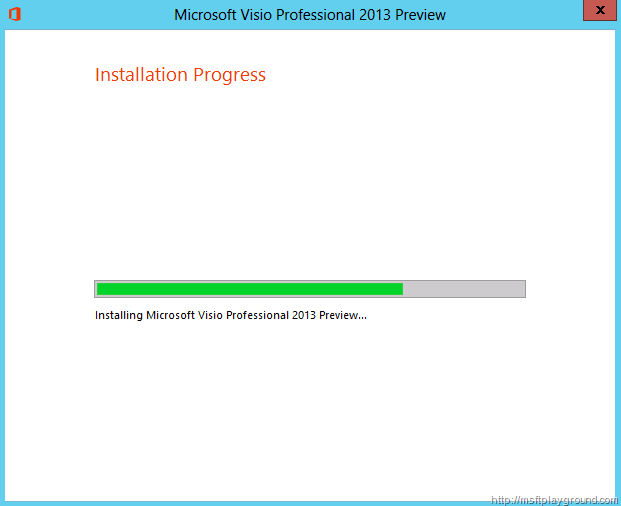 When the installation is done start the installation off the full version of Visio. 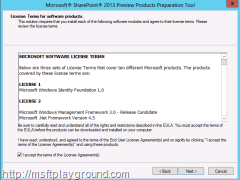 The Visio installation will also start with the license term screen. Accept the license again and click “Continue” to Continue. This time we will just click “Install Now” to Install Visio. 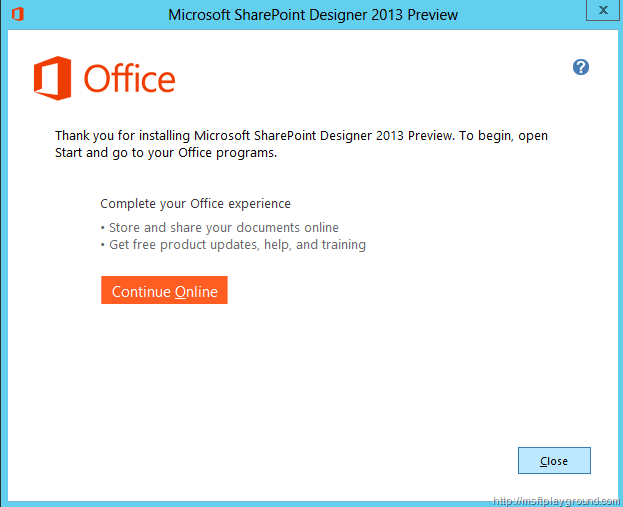 Next up is the preview release of SharePoint designer double click the exe file to start the installation. 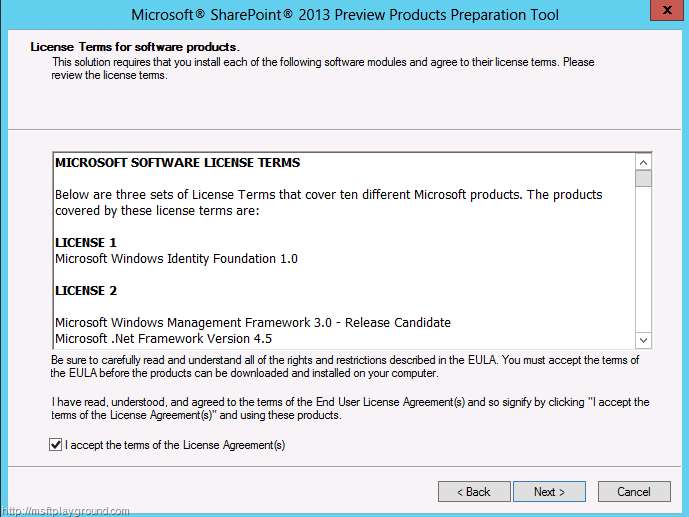 This will also start with the “License Terms” screen. Accept the license and click “Continue”. On this installation we will also use the “Install Now” option. With the installation ready it is time to place the documentation on the machine. Place the TechNet documentation file (CHM) on your desktop and start the Installation of the Client Components SDK. Don’t forget to “Unblock” the chm file on your desktop or else you will not be able to read the file. 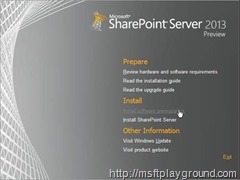 With that all in place we will install the prerequisites of SharePoint. Mount the image on the server to start the installation. 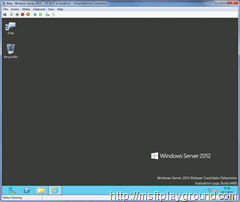 The installation will have a splash screen like the one in SharePoint 2010. Select “Install Software Prerequisites” to start the installation of the Prerequisites. Accept the license terms and click next to continue. This will start the installation of the prerequisites. 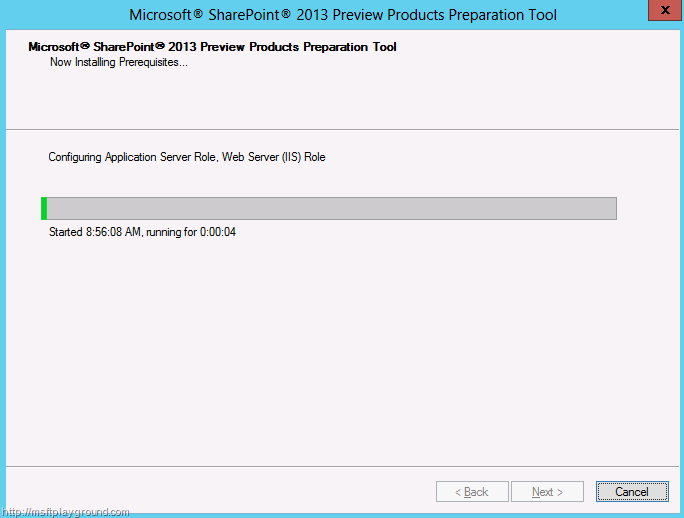 With the installation off the prerequisites done it is time to install SharePoint 2013. 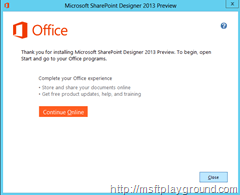 We will discuss the installation off SharePoint 2013 in the following post. 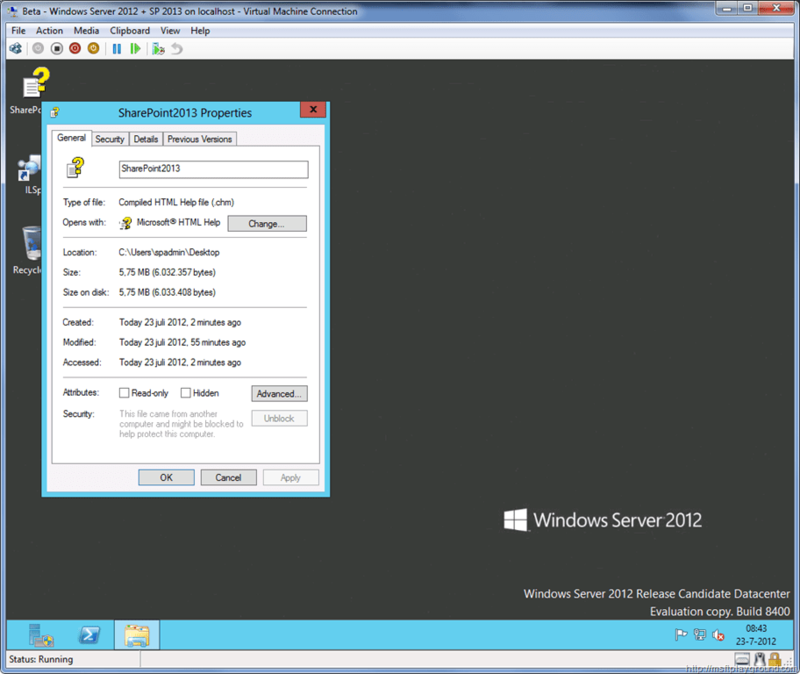 I have already my HyperV 2012 server as DC with SQL Server 2012, but I’m stuck with prerequisites. 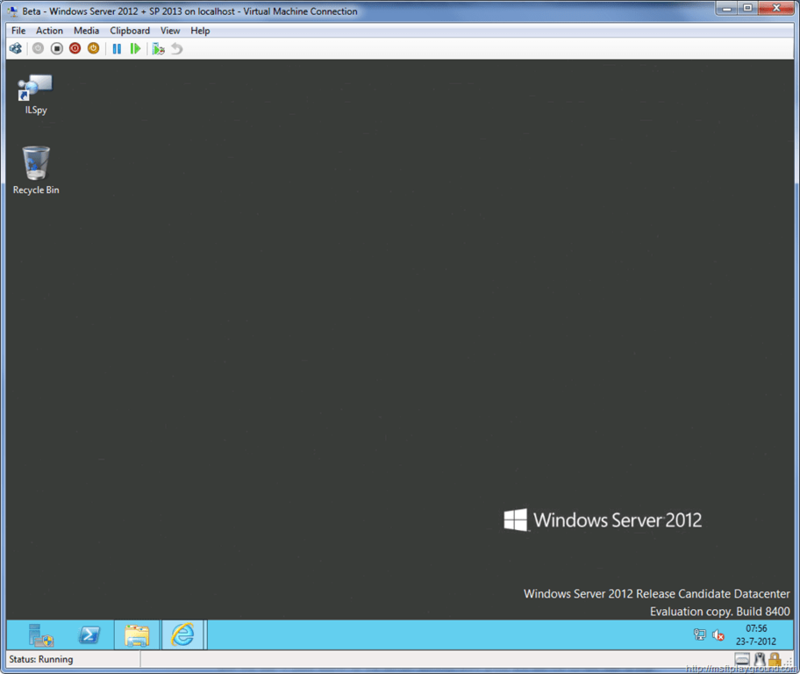 Because it wants to install SQL 2008 R2 native client, while I’m running it all on my single box (which is a SQL server). And now it wouldn’t continue… Any suggestions? Thx! BTW: say HI to Wesley on my behalf. Dear Arjen, tank you for your comments. I haven’t seen the error with the SQL 2008 Client. Can you post the error you are having? I will also say hi to Wesley for you. As told already, proxy authentication caused the problem. I ran the prerequisites at home, without problems. Can I point you, and others to a PowerShell to download them all? 😉 Have a look at http://www.dontpapanic.com/blog/?p=241. Very convenient when no internet connection is available! Clear your temp files, and re-download the 64-bit version of the client. Save it locally to your server, shift right-click the installation file and copy the path. Click Start –> Run, type CMD, right-click the command prompt and “run as administrator”. Right-click to paste the path, and then add /log:c:\log.txt. Hit enter, it will start the installation if it fails it should have a verbose log of the installation and why it is failing. If you post the information here I can help you. Thank you for your response. I got past the issue by installing SQL Server 2008 R2, then SP1, then the cumulative update package 2 for SP1. Once I did that followed by a reboot, all was well adn the prerequisites installed fine. Not sure why SQL had to be installed first but that was the trick to the compatibility issue.